Alberta Western Uplands offers premium upland Pheasant hunting on one of the largest working cattle ranches in Alberta. We are located in South Eastern Alberta in the dramatic wind carved valley of the Red Deer River. 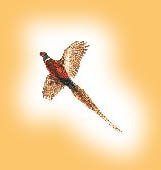 The ranch offers 34000 acres of some of the finest pheasant hunting habitat in the west and our bird hunting guides are some of the most experienced in Alberta. 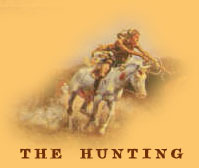 The bird hunting area sits along one side of about 5 miles of the Red Deer River bottom. The Valley floor varies but is about a mile wide with steep coulees climbing maybe 300 vertical feet to the prairie grasslands above. In total, there are 53 sections of land on the Ranch. (a section is measured one mile by one mile). There is lots of space here and not a lot of neighbors. 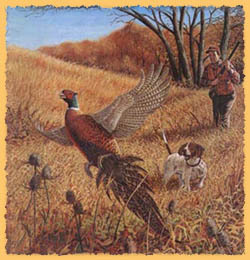 The cover encompasses a little bit of everything to challenge both the bird hunter and different types of hunting dogs. Red willows line the banks of the river with occasional gaps. 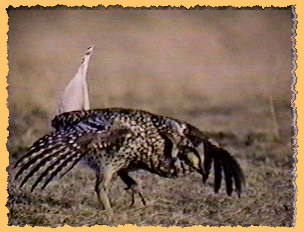 They are not too dense or wide but provide good protection for the pheasants from birds of prey. Next there is a strip of high prairie grasses from 50 to 300 yards wide that will provide more good cover for the birds and excellent opportunity for dog work and clear lines of sight for safe shooting. The high grasses run into sections of thick, thorny little trees that will be challenging for the dogs and shooters. The birds will run like crazy in this thick brush and then will flush at the gaps. Definitely exciting bird hunting! Then there is a little open grassland coming to the base of the bluffs and coulees that look down on the river valley. All along these hillsides are a series of natural springs that provide more cover and water for the birds. These springs are also, usually part of the steep coulees that will generate some challenging shooting opportunities for the more athletically inclined bird and pheasant hunters. As you stand on the bluffs above the river valley and look down, you can imagine the presence of a proud Blackfoot warrior – and share in his sense of awe and excitement at the hunt. The view is breath taking, yet peaceful. Looking down, you know there are pheasants and upland game birds to be found!